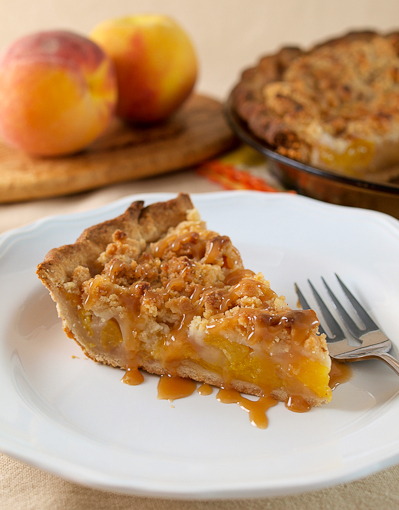 First, comment below and tell me about your favorite pie recipe. Is it your grandmother’s apple pie? Maybe it is a recipe you clipped from the local paper? Whatever it is, tell me about it. Inquiring minds want to know! Second, Tweet about this giveaway with a link back to this post so your followers can enter too, then post a link to that tweet in the comments below. Tweet whatever you like, and if you want to mention me (which would be lovely) my Twitter handle is @BakingBlog. Finally, tell your friends on Facebook by sharing a link to this entry. Just post a link back here so I can see you did. The giveaway ends July 1st, 2012 at 11 pm CST. The winner will be selected at random and notified via email (so be sure to use a valid email address when commenting). In the event that the same person wins both books (with multiple entries it could happen) a second winner will be selected. Limit 3 (three) entries per person. Open to residents of the US and Canada only (sorry, shipping is darn expensive!). I am providing the books from my own personal supply. 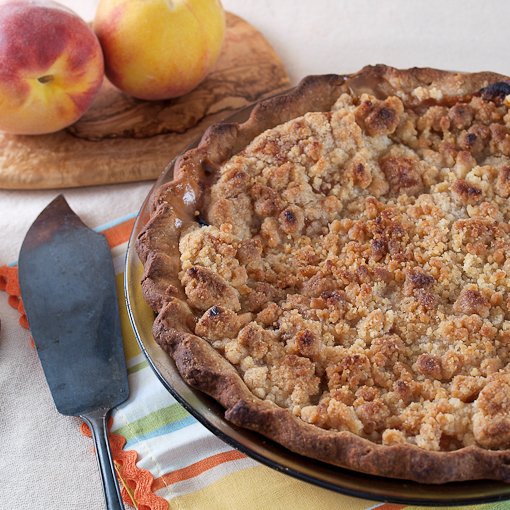 What pie cookbook giveaway would be complete without a pie recipe? This recipe is not in my latest book, this is an all new creation! Summer is here and that means the peaches are back at the market. If you have been reading for a while you know that I love peaches, so when they are in season I buy up as many as I can. 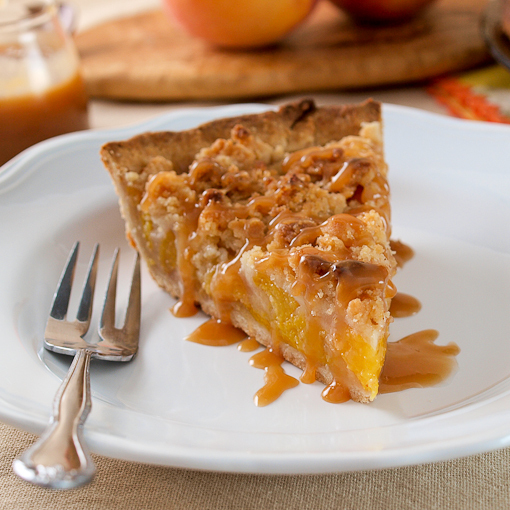 For this pie I combined a little salted caramel sauce into the filling to add buttery richness. 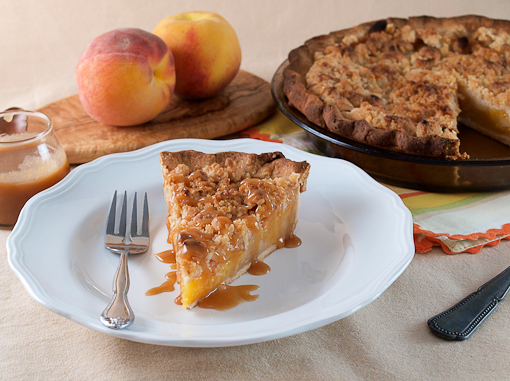 Caramel and peaches are beaches and margaritas, they are made for each other, so the addition was a no-brainer. Rather than a typical pastry crust for the topping I decided on a buttery crumble. It adds a touch of rustic charm to this somewhat sophisticated pie. I like this pie best with no adornment, but you could serve it with ice cream, or whipped cream if you wanted to doll it up. Personally, I don’t need the frills. It is just fine the way it is! Salted caramel sauce, for garnish. Begin by preparing the crust. In a large bowl combine the flour, brown sugar, and salt. 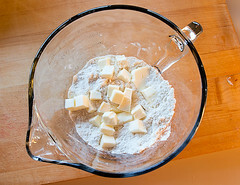 Whisk to combine then add the vegetable shortening and rub it in with your fingers until it completely coats the flour. 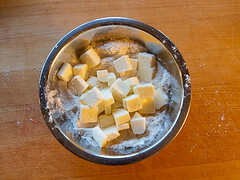 Add the cubed butter and, still using your fingers, rub it in until the mixture looks like coarse sand and no large pieces of butter remain. 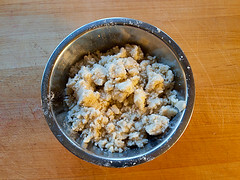 Add the water, a tablespoons at a time, until the mixture forms a shaggy ball. 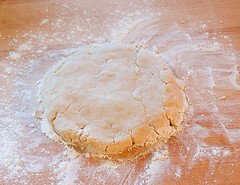 Turn the dough out onto a lightly floured works surface and press the dough into a disk. Flatten the dough, fold it in half, and flatten it again. 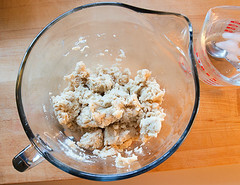 Repeat this process 4 times, then wrap the dough in plastic and chill for 1 hour. 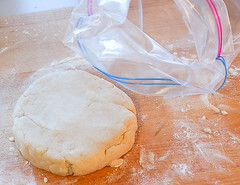 Once chilled pull the dough out of the refrigerator and let stand for 5 minutes to warm up. Roll out on a lightly floured surface to 1/8-inch thick, about a 12-inch circle, turning the dough often to make sure it does not stick. Dust the surface with additional flour if needed. 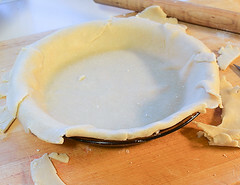 Press the dough into a 9-inch pie plate and trim the dough to 1/2-inch of the plates edge. 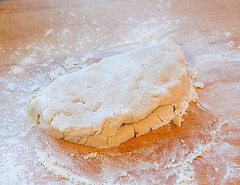 Tuck the dough under and crimp the edges. Cover with plastic and chill until ready to fill and bake. In a medium bowl combine the flour, sugar, and salt. 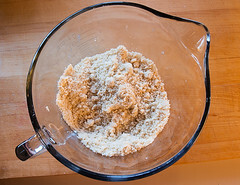 Add the butter and rub it into the flour mixture with your fingers until the mixture resembles coarse sand. Cover and chill for 30 minutes before using. Now, prepare the peach filling. 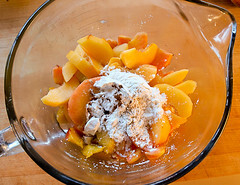 In a medium bowl combine the sliced peaches, cornstarch, salted caramel sauce, vanilla, cinnamon, and cardamom. Gently toss to coat, then allow to stand for at least 10 minutes at room temperature. 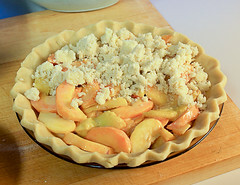 To assemble the pie fill the pastry crust with the peach filling, then evenly spread the crumble over the top. Bake for 12 minutes, then reduce the heat to 350 F and bake for 45 to 55 more minutes, or until the crumble is deeply golden brown and the filling is bubbling all over. Allow to cool to room temperature before serving. Enjoy with a drizzle of salted caramel sauce!